Wow. I had no earthly idea Mangum was that much of a major political figure. Thanks, as always, Gary. Great post. Very sad to think what will happen in next 100 years. With no protection this site could totally disappear forever. Thanks for documenting it Gary. Great job Gary, especially for reading the landscape. A wonderful post. In the same graveyard is buried a notable early professional historian, Stephen B. Weeks, who was a collateral descendant of Mangum. Weeks was instrumental in establishing the North Carolina state archives. Mangum famously responded to William Seward's "higher law" speech by telling President Zach. Taylor, "if those were Whig doctrines, I was a Loco-foco." OK, I don't mind showing my ignorance: what is done in or to a demonstration/training forest? And would that be contradictory to a reasonable caretaking of the cemetery? Anon: the Hill forest is used by NC State's forestry program as a lab for various forms of forest management, including selective logging, thinning, replanting, and managed clearcuts. There's nothing to prevent it from also maintaining the cemetery well other than attention and money. Thanks for explaining, Michael. It's such a strange term, and I was hoping the phrase "controlled burns" wasn't part of the answer. I can't tell you enough how much I appreciate the map links to these places. I must be spatially-challenged because I grew up in the area and knew these places, but never realized exactly how they fit together. So, thank you, Gary! Also, you are my hero this week. I've been trying to figure out where some old family addresses (from the early 1900s) are and Google kept telling me there were no such addresses or streets. I finally slapped myself on the forehead and searched on ED. Not only had you covered the streets, but in some cases had pictures of the exact addresses! That shriek of happiness you heard around 3 AM your time was me. Thanks Steve, but this is one of those cases where the cem census info has errors. That's no reflection on Allen Dew, who does a stellar job of the site. He can only work with the info available. Supposedly no one knew where this site was for a long time, then when it was found (according the the Durham paper article), the people who found it didn't want anyone else disturbing it, so were vague about the location. I know people who have gone looking for it based on the info in the Cem Census and say it is just not there. One person found it years ago, but can't remember exactly where it is now except that there was a creek nearby. And, of course, thre are no pictures of the actual site, only of the headstone fragments. Kinda reminds me a little of Gary's post on Nancy Warren Chamblee's grave and this Mangum gravesite -- just forgotten and not a lot of documentation on them. I realize every gravesite can't be protected, but I'd sure love to see them all photographed and plotted. Ah, I see. Sounds like another Nancy Drew/Hardy Boys mystery to me! Do you have the article? Is it online somewhere? Perhaps someone (Gary, Mitch Fraas, et al) is already looking for it, but I can ask around. Doris Tilley also knows about the Chamblee cemetery; she's very nice and she still lives in Durham. I have the article somewhere around here. It's not online that I know of. I believe Doris Tilley was on of the people found the site back when they recovered the fragments of Sindey and Mary Duke's headstones. There have been all kinds of rumors about it -- that some of the graves were dug up as part of an initiation prank, that the bodies have been moved, etc. I don't know how much truth there is to any of it. What I'd like to do is get back there and find it, take some pictures, map it out. Thank you so much for the information and photographs. William B. Hampton was my grandfather; Zachariah his brother. My father lived in the house as a boy; he would talk about "The Old Mangum Place" from time-to-time but I had never seen it. The Hamptons are also a very interesting family whose roots go back over two hundred and fifty years in Granville, Orange, and Durham counties to an Andrew Hampton. Andrew was an entreprenur who owned a mill as well as an ordinary and sold supplies to other ordinary owners. He was a Militia Captain, Vestryman, and bought and sold numerous properties. His son Zachariah was killed in the Revolutionary War at the Battle of Eutaw Springs. William B. Hampton was a merchant and farmer who owned three farms, a saw mill, and a general store. I'd love to hear from any Hamptons descended from Andrew. Thank you for telling me where this family graveyard and property are located. I am of this family, and cannot understand why the state is not making this an historical landmark. My gggrandparents house, the Jesse and Mary Parrish Mangum house, is still standing and is on the historic inventory of Durham County. I have tried to get help to protect the property through the Historic Preservation council of NC. I have received no response to date. I do not understand why historic properties are being destroyed and demolished in this town. Does anyone care??? I wrote a biography of Willie Mangum. You can read it on line. I'd like to mention that while the Hill Demonstration Forest is first and foremost a teaching forest for the NCSU Forestry Dept., it is also an important recreational resource: NCSU permits horse riding, hiking, and biking on-trail (with a paid permit). NCSU labors mightily to manage the forest in a sustainable fashion. Yes, there are some small clear-cuts (one, about a mile N of the Walnut Manor site, is a Forest Service research site for watershed management methods). But, overall, Hill Forest is a well cared-for greenspace. Shameless plug: The Friends of Hill Forest, (http://friendsofhillforest.org/index.php) where you'll find (among many other things) a work-in-progress interactive trail map of the Forest (soon to include a marker for the site of Walnut Hall). We're grateful to Gary for permitting us to rephrase much of his research on Walnut Hall for our "About Hill Forest | History" page. We are descendants of the Mangum's that established the Mangum Township. Thank you for all this info! We are planning a trip up to Durham to visit some graveyards. It's too bad that the Walnut Hall estate is no longer. While we're in Durham, are there any other Mangum related buildings/sites in place that we could visit? I have since found out through the personal of the NCSU Forestry Division, College of Natural Resources that the Willie Person Mangum Cemetery was cleaned up and put back in order in August , 2017 through the efforts of the BAHAMA Ruritan Club with participation of about 25 members. My thanks go out to this organization. 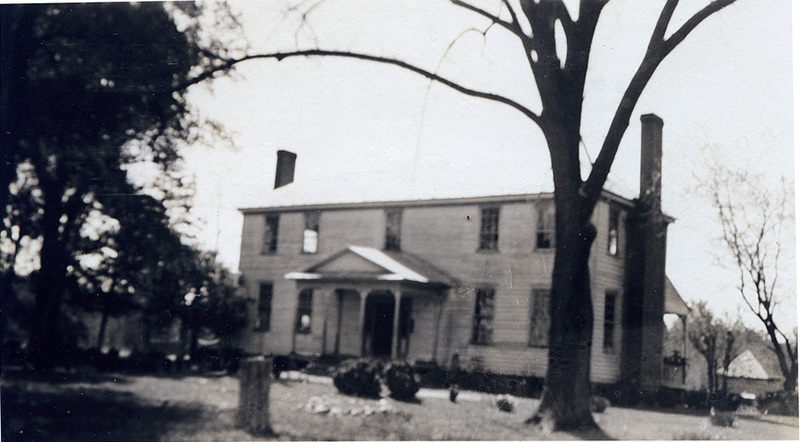 My current project in Bahama/Rougement is going about trying to preserve the Jesse and Mary Mangum (cousin of Willie Person Mangum) homestead circa 1820. It is one of the oldest buildings left in the area. You can see a picture on OPEN DURHAM under historic buildings. The cabin sits on land originally granted to Arthur Mangum, Sr. by the state of North Carolina NC 815) in 1784. Additional information and pictures are available on my Facebook Group page "JESSE MANGUM'S CABIN." If you would like more information on these efforts contact me - OPSLOT@atmc.net. Mangum would have become president had John Tyler been killed in the US Princeton cruise explosion, along the Potomac River, of February 28, 1844. The incident killed several, including two of the president's Cabinet, and injured, even more. Was the Senator in attendance, that eveing? Do any of his writings address the incident? Willie Person Mangum, son of William Person Mangum was born in 1792. He was educated at "academies in Hillsborough, Fayetteville, and Raleigh" before attending the University of North Carolina. He studied law with Duncan Cameron and was admitted to the bar in 1817. He was elected to the state legislature at 26 years old, served as a Superior Court judge in 1819 (the same year his was married to Charity Alston Cain of Hardscrabble) and elected to the U.S. House of Representatives in 1824. He was a North Carolina Superior Court judge from 1826-1830, and he was elected to the U.S. Senate in 1830. He served in the U.S. Senate until 1853, serving as president pro tempore. Mangum built his Greek Revival residence "Walnut Hall" as an addition to his father's home, which had been about around 1800. Walnut Hall was constructed from 1842-1845. The style was similar to that of Fairntosh, the home of his mentor Duncan Cameron. Several other buildings were constructed on site as well: an office, a kitchen, an icehouse, a smokehouse, a carriage driver's house, and several barns. In 1860, there were three houses for enslaved people on the property. 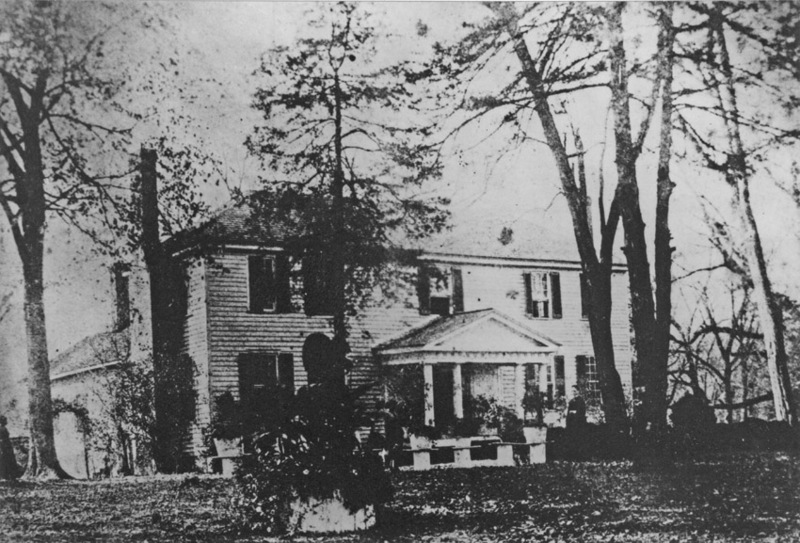 The house was named for two large walnut trees extant on the property; he planted the yard with specimen trees and other plants procured in Washington. His wife Charity managed his 600 acre plantation; Mangum kept 20 people enslaved in 1850, which decreased to 12 people by 1860, and 4 by 1861. The plantation grew wheat, corn, and tobacco. Mangum evidently inherited significant bad debts from his father and struggled with his financial affairs, but his father-in-law, William Cain, repeatedly saved him from financial ruin. 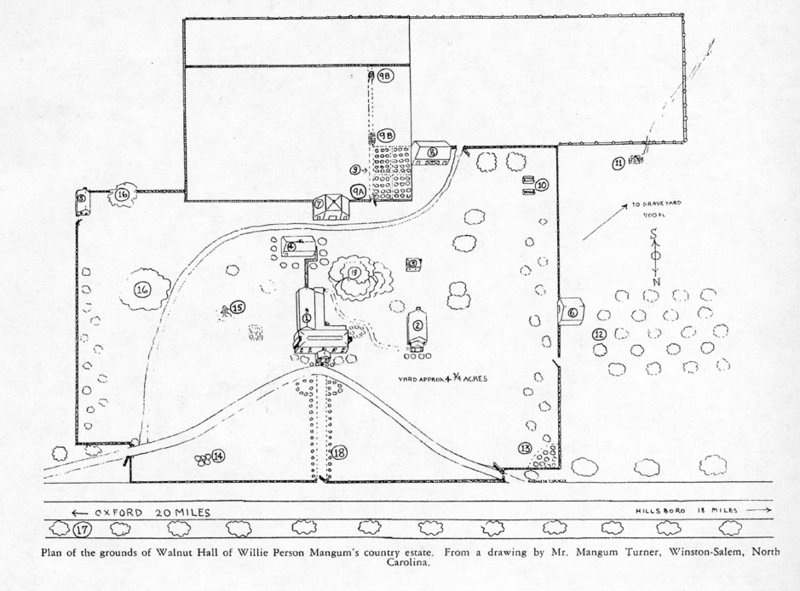 Walnut Hall Site Map, drawn by Mangum Turner. Key: (1) Residence, front completed in 1844, ell about 1800; (2) New office, 1844; (3) Old office; (4) Kitchen with huge fireplace; (5) Carriage driver's house; (6)Ice house; (7) Smoke house and woodhouses; (8) Feed barn and carriage house, constructed about 1800; (9) Rose garden; (9A) Rose arbor on entered wide garden walk which was bordered with shrubbery; (9B) Two very large scuppernong vines; (10) Corn cribs; (11) Walled spring; (12) Orchard; (13) Rare shrubbery, "some from foreign lands; (14) Summer house of cedars, tops fastened together with chains; (15) Well; (16) Two huge sugar pear trees planted about 1820 - scions from trees brought by Mangum's grandparents from Pennsylvania prior to the Revolution; (17) Both approaches to grounds and in front was avenue of cedars; also grove cedars each end of grounds; (18) English box bordered walk ending in circles in front of residence; all walks covered with crushed white flint rock; (19) Two enormous walnut trees, each in 1899 measured 18 feet in circumference; longest limb was 86 feet. "Originally a Jacksonian Democrat, Mangum opposed protective tariffs and instead supported states' rights. In 1834, he broke with Andrew Jackson over several issues, especially the removal of federal deposits from the Bank of the United States. Mangum resigned from the Senate in 1836 after refusing to carry out voting instructions from the North Carolina legislature, which the Democrats controlled. His political views were particularly well received in South Carolina, where he won all 11 electoral votes for president of the United States in the 1836 election. Mangum was elected in 1840 as a Whig to fill the Senate vacancy caused by the resignation of Bedford Brown. He was subsequently reelected and served until 1853. As president pro tempore of the Senate between May 1842 and March 1845, he was (under rules of the time) next in line for the presidency since President John Tyler did not have a vice president. Mangum was an astute political leader, an effective debater, and a powerful campaigner with personal charm and magnetism. A close friend of Daniel Webster's, Mangum helped persuade the Massachusetts senator to make his famous "Seventh of March" speech during the Compromise of 1850 debates. When he failed to win reelection in 1852, Mangum returned to North Carolina, where he practiced law." 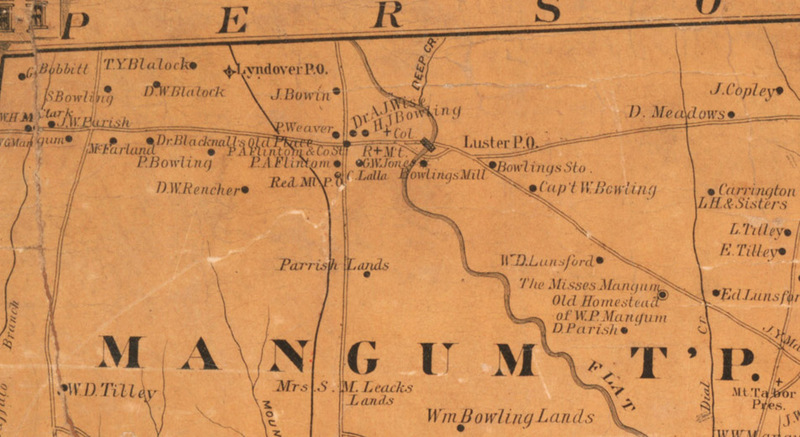 By 1860, Mangum had been partly paralyzed by a stroke; when the Flat River Guards organized from nearby families (including his own son, William Preston Mangum) to fight for the Confederacy, they marched to Walnut Hall before leaving for the front. Willie P. Mangum had to be carried out to his front yard to bid them farewell, and lent them this confidence inspiring speech (although other sources dispute that he could speak after his stroke): "Boys, God bless you every one, but you can't succeed. Their resources are too great for you." His son was killed less than a month later at Manassas. Willie P. Mangum died soon after hearing of his son's death, on September 7, 1861. Both were buried in the family cemetery on the grounds of Walnut Hall. Charity Mangum and her daughters continued to reside at Walnut Hall, and to farm the land after Willie P. Mangum's death. After Charity's death, the daughters began to sell off portions of the acreage to neighbor Zachariah Hampton. One daughter, Sallie, married and left Walnut Hall. Martha and Mary Mangum, two of his daughters, did not marry; Martha started a "female academy" at Walnut Hall in 1863. 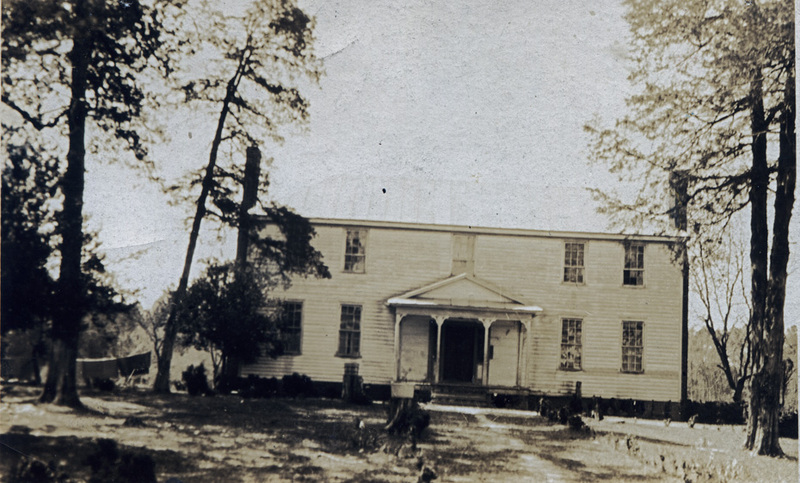 The two daughters continued to reside at Walnut Hall until their deaths in 1902. The estate was placed into public auction after their deaths; it was purchased by neighbor William B. Hampton with a bid of $3850 for 565 acres. One acre including Mangum graveyard was excluded from the sale; it continued to belong to the Mangum descendants. The Hamptons lived at Walnut Hall until 1916, when they moved to Bragtown. The house was rented after that to various tenants. By 1929, the house was reportedly in poor shape. On Christmas Eve, 1933, the 1845 section of the house burned and was destroyed. So-so quality aerial of the property, 1955. The drive and some structures are still visible. The older, rear structure, dating from ~1800, evidently survived until ~1980, when it burned and was destroyed as well. The site remained in the Hampton family until 1977, when it was acquired by the North Carolina State University School of Forestry, presumably to add to the adjacent Hill Forest. The site was difficult to locate; it is now part of the Hill Forest (once part of the Quail Roost land holdings, donated to North Carolina State University as a demonstration/training forest.) The main clue from the roadway are two rather immense poplar trees. Back in a ways, it appears that there is the site of the house, surrounded by varied mature hardwoods, including some very impressive cedars. Further back on the site, on the edge of the woods, are a few abandoned tobacco barns. A ways further through the woods, and up the hill sits the Mangum family graveyard. Fenced, but semi-abandoned in the woods - an unfortunate final end for one of North Carolina's most pre-eminent political figures. Even more unfortunately, his son, William Preston Mangum, was disinterred by grave robbers who stole pieces of his uniform; he was re-interred in 1984. While the graveyard was still presumably owned by the Mangum heirs (then two descendants living out-of-state) in 1984, it is not noted as a separate parcel now on the county tax map; I presume that this means that it was deeded to the state at some point. It seems utterly bizarre to me that this state-owned property is not a State Historic Site. Many thanks to Chris Graham and David Southern for guidance in locating the property; thanks to Michael Hill for his generous provision of a report he generated for the State of North Carolina after the disinterment of William Preston Mangum in 1984.